277 Dwight Street: 4 units: 3 2-bedroom units (from 670 to 750 sq ft); 1 1-bedroom unit (600 sq ft). All electric apts. No utilities included. 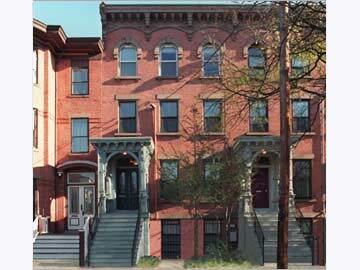 This historic brownstone is just off Yale's attractive shopping area on Broadway. Each apartment is a flat occupying a full story. The apartments have hardwood floors, and an open plan for the kitchen and living room areas, with a bar-countertop for casual dining. Kitchens have dishwashers. Private backyard. 1 bedroom flat $1,215 Gorgeous 1 bedroom apartment located on 2nd floor of 4 story history brick row house building. The apartment offers lots of natural light, open kitchen with breakfast bar and dishwasher. This is a great location for Yale Law Students or anyone that needs to be close to the Broadway section of Downtown New Haven.